October 22, 2018, 10:35 AM · During the summer between finishing my post-graduate years at the Guildhall School of Music, and beginning my post-post-graduate studies in New York, I played in a chamber orchestra that toured South America for five weeks. It was an amazing time. We went to São Paulo for a few days, and then to Rio de Janeiro for a week, and then to Buenos Aires for two weeks. After that, it was a ridiculous schedule of a crack-of-dawn flight every morning, and a different country and concert every evening, up the east of the continent all the way to Mexico City. One day we were at sea-level, the next at 15,000 metres. I remember walking on stage for one concert, and I actually thought the platform itself was moving, I was so disorientated. Then I had to sit down and play Schoenberg’s Verklärte Nacht. The life of a musician! Buenos Aires was interesting because two Russian violinists were staying in the same hotel as us. One was Philippe Hirschhorn, with whom we were going to perform Vivaldi’s Four Seasons in several concerts. By coincidence, Boris Belkin was there too. He was performing in the city at the time. Since we were there for two weeks, I decided that I should make the most of the situation and ask Hirschhorn for a lesson. What an opportunity! 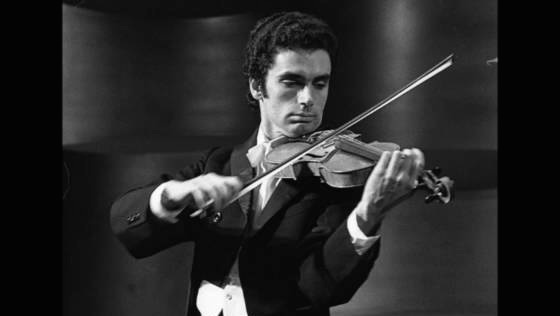 For anyone who doesn’t know, Hirschhorn won the Queen Elizabeth Competition in 1967, and his flawless performance of the Sauret cadenza of the Paganini Concerto No. 1 became legendary (See from 5'00", though it's not the cadenza). I was (and remain) fascinated by the typical Russian bow arm, which is nothing like the Flesch that I had been brought up on. I don’t know why I did not also ask Belkin for a lesson. Perhaps because I had nothing to do with him, whereas Hirschhorn was playing with us, or because I thought it would be disrespectful to Hirschhorn to ask Belkin too. A couple of times, however, I did lurk outside his room listening to him practicing. Anyway, Hirschhorn passed by when I was sitting with some colleagues in the hotel foyer, and I went up to him and asked if he would hear me play. "Sure," he said. "What about now?" I explained that we had been travelling a lot, and playing concerts, and that I would prefer to do some practice first. He looked at me a little strangely, but agreed, and said to let him know when I was ready. A few days later, he came up to me and asked if I would like the lesson then. Oh, I explained, in fact there had been a lot of rehearsals each day, and no time whatsoever to practice, and I was very tired, and so on. I was very apologetic. He merely shrugged, said again to let him know when I was ready, and walked off. It happened a third time, a few days later. Hirschhorn came up to me in the hotel, and suggested that we immediately go off and have the lesson. I tried to make my excuses again, but he stopped me. "Listen," he said. "What you are looking for is security. But you will never find it, because it doesn’t exist! You simply have to play!" I tried to protest that if I was going to play to him, I wanted time to prepare, but he would have none of it. "You have been up and down that fingerboard thousands of times in your life! You don’t need to “practice”! You already know where all the notes are!" Well, I didn’t have the lesson then, or ever. We played the final concert with Hirschhorn, the stay in Buenos Aires came to an end, and that was that. But I often thought about it, and his comment about the fingerboard immediately became a central reference point for me forever. It ties in nicely with the ideal of performance being a matter of "prepared improvisation," rather than of repeating what has been prepared earlier. I was greatly impressed when I first heard that the cellist Pablo Casals would practice every phrase or passage in seven or eight different ways, and not decide until he was in the concert which way he was going to go. Greatly impressed, that is, until I realised that of course that is what all great musicians do! It is impossible to approach a performance from the standpoint of trying to do the same as you did earlier, in your practice. You can have a good idea of how you are going to play, but you can’t know exactly. I am reminded also of when I played the Bach Double Violin Concerto with Emanuel Hurwitz. A couple of weeks before the concert, before we had rehearsed together, I phoned Mannie and said that I had played the Bach Double several times before, but that each time I had ended up giving it only the briefest amount of practice, and that each time it had ended up that there was only one quick rehearsal with the other violinist, just before the concert. This time, I said, I wanted to do it ‘properly’, and I asked him if we could meet several times and really rehearse it. "Well, okay," he said hesitantly. "But just so long as nothing gets 'fixed'!" It was a priceless comment. What he meant was that he did not want to have to decide that this phrase was going to be played like this, and that other phrase played like that! If you try to play in that way, it is a recipe for a stilted and possibly nerve-wracked performance. In the end, we had one rehearsal the evening before the concert, and guess what? We played it through once, from beginning to end, and then drank coffee and chatted until it was time for me to go home. The concert went very well, by the way! I also love what I have heard about one element of the way Itzhak Perlman teaches. Apparently, he often says to students, about a phrase or a passage, "Ok. That was great. Now play it again completely differently. Why? Because you can, and because there isn’t just one way of playing it. But still make a success of it!" Then, when they have done that, he says, "Ok, now play it completely differently again, but still make a success of it!" Surely, this is the right way to go about things! The alternative is so very boring, academic and uninspired. Coming back to Philippe Hirschhorn, what he was expecting was for me simply to take the violin out of the case and make some music with it. What could be more natural or normal! Of course I should have simply gone and played to him no matter what, and it would have been impossible that I would not have learnt something. Perhaps something I would still be leaning on to this day. The only thing that held me back was pride, I suppose, and perhaps awe of this Russian super-talent. It’s a good thing to remember! And then stop worrying, simply listen, and share something in your music with others. EDITOR'S NOTE: Simon Fischer has recently made his original "Basics" articles, violin pedagogy articles which appeared in The Strad magazine from July 1991 until November 2014, available on his website, to download for free. Click here to find his articles. October 23, 2018 at 04:45 AM · Nice article, thank you. Just wanted to add that Philippe Hirschhorn was actually Latvian who studied at the conservatoire in Riga. He later studied in St. Petersburg, Russia. After emigrating with his family to Isreal, he lived in Belgium. Not sure he should be described as being Russian. October 23, 2018 at 08:24 AM · I’m sure Simon meant to write 1,500 metres. But it’s interesting to speculate on music at a very high altitude: the air is thinner so it would presumably be hard to play in tune. Or to hear as well? Cusco and Lhasa might give some idea. Thanks about the fact that Phillipe Hirschhorn was not 'Russian' but Latvian. My mistake. But since Latvia did not leave the Soviet Union until 1991 - or the Soviet Union did not leave Latvia alone until then - and Hirschhorn did study in St. Petersberg, perhaps his wonderful playing could be counted as 'Soviet' anyway? I have no idea. I don't wish to offend any national sensibilities! And we sort of did! Yehudi Menuhin was sitting in the front row, gazing up at us. It was like a weird dream. October 25, 2018 at 12:50 PM · 5,000 meters or maybe 15,000 feet - at least in South America on this planet! October 25, 2018 at 06:02 PM · Simon many thanks as usual for your contributions on this forum! It's a gift for all of us.